The kit includes all the reagents you need for making 10 full electrophoresis and the DNA visualization (for 10×7 cm o 10×10 cm gels). * Ekitblue: 10 full electrophoresis. > Kit includes: 10 agarose pills, 150 ml 10x TAE, 500 µl loading buffer, 25 ml DANABLUE, 100 ml FLASHBLUE. * Ekitsafe: 10 full electrophoresis. 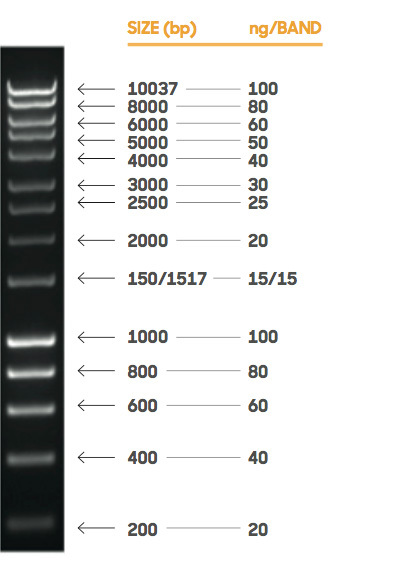 > Kit includes: 10 agarose pills, 150 ml 10X TAE, 500 µl loading buffer, 25 µl GELSAFE Nucleic Acid Gel Stain (UV light transilluminator needed). NON TOXIC alternative for the nucleic acids detection. Nucleic acids are blue as electrophoresis occurs. 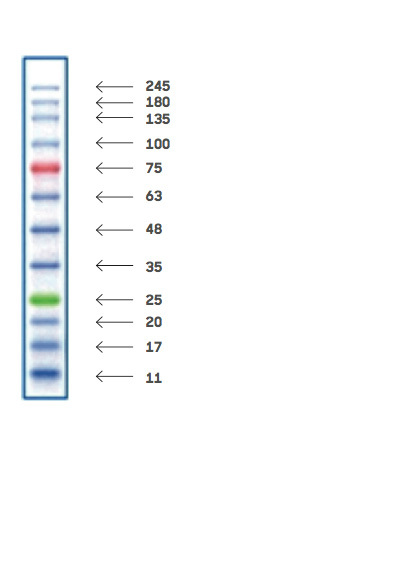 UV light transilluminator is no needed to visualize correctly the DNA, but it requires a post-staining with FlashBlue. > Kit includes: 25 ml DANABLUE, 100 ml FlashBlue. NON TOXIC alternative to the traditional ethidium bromide (EtBr) stain for detecting nucleic acid in agarose gels and with the same sensitivity. It needs a UV light transilluminator. > Kit includes: 1 ml GELSAFE. 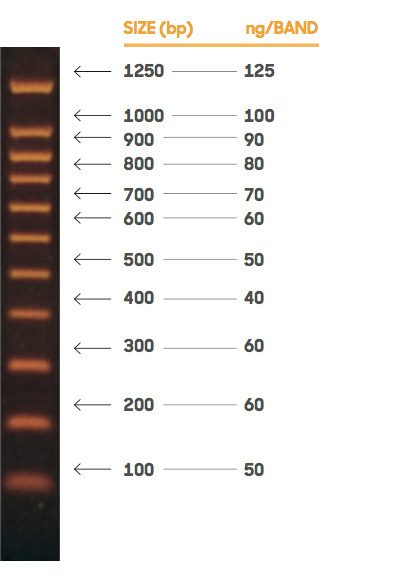 Agarose electrophoresis buffer for nucleic acids, the working concentration is 1x TAE. HOT START Polymerase (2x) ready for use, it allows amplify any fragment so that the user only has to add water and primers. An activation step of 10 minutes at 95ºC is required, in this way non-specific products as “primer-dimers” are removed. It also contains a red dye that allows direct seeding in the agarose gel without adding loading buffer. > Kit includes: 1.25 ml POLYMERASE MIX. It contains 14 regularly spaced bands of 10,000 bp to 200 bp. Each band represents an exact amount of DNA, it allows DNA quantification. It is supplied in a format “ready to use”, using 20 µl in each load. > Kit includes: 1 ml. It contains 11 regularly spaced bands of 1,250 bp to 100 bp. Each band represents an exact amount of DNA, it allows DNA quantification. It is supplied in a format “ready to use”, using 20 µl in each load. It is a mixture of 12 pre-stained proteins carefully selected to facilitate estimating molecular weight of the protein during SDS-polyacrylamide electrophoresis gel. This marker protein is ready to use and does not require previous preparations before being applied into the wells of a polyacrylamide gel. > Kit includes: 500 µl.